In movies like terminator, robots can do anything with their eyes. But bionic vision isn't just for hollywod anymore. Researchers at the University of Washington are now working on a project to make electronic contact lenses with a computer-like display. 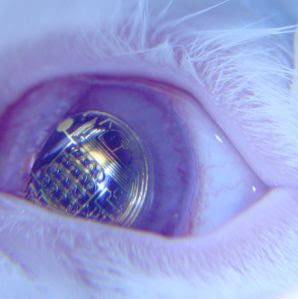 The lenses will create an image that is suspended in air about a foot or so in front of your eyes. Each lense is equipped with tiny electronics and antennas that could communicate with your cellphone, laptops, or other helpful gadgets. Since the images are semi-transparent, they would not block your line of sight. The electronic circuits were inputted through the use of nanotechnology. Researchers say virtually anyone; gamers, pilot, doctors, or just people with bad eyesight could benefit from the technology. 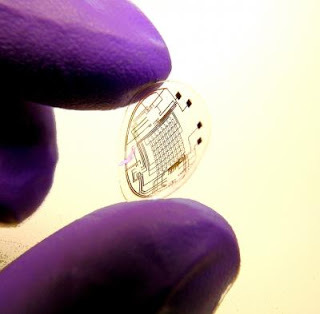 These lenses could be used to improve a ours vision or even to continuously monitor a person's health. It was first tested on a lab rabbit shown in the picture below. The researchers are still working on how to transmit power to the lens wirelessly. Invisibility Cloak - Myth or Reality?